Alice Herz-Sommer died in London on Sunday after a short illness. AliceHerz-Sommer pictured in July 2010. ALICE HERZ-SOMMER, THE world’s oldest known Holocaust survivor and the subject of an Oscar-nominated documentary, has died in London aged 110, her family has said. 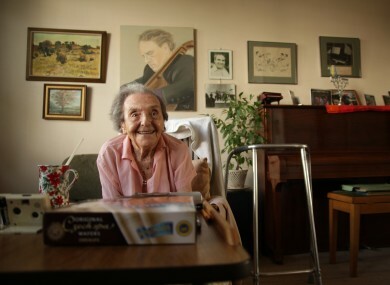 Herz-Sommer, originally from Prague in what is now the Czech Republic, spent two years of World War II in Czechoslovakia’s Terezin concentration camp, where she entertained inmates by playing the piano. Her grandson, Ariel Sommer, said: “Alice Sommer passed away peacefully this morning [Sunday] with her family by her bedside. Much has been written about her, but to those of us who knew her best, she was our dear ‘Gigi’. She loved us, laughed with us, and cherished music with us. She was an inspiration and our world will be significantly poorer without her by our side. We mourn her loss and ask for privacy in this very difficult moment. According to an update on the Facebook page for her Oscar-nominated film “The Lady In Number 6: Music Saved My Life”, she died on Sunday after a short illness. “She was still living in her apartment, when she fell ill on Thursday, she spent two nights in hospital and passed this morning,” it said. A later update read: “heaven just got a little better”. The 38-minute film, in which she shares her life story and describes the importance of music and laughter for a happy life, is up for best short documentary at Sunday’s Academy Awards. “I am Jewish, but Beethoven is my religion,” she says in a video-clip. “I am no longer myself. The body cannot resist as it did in the past. I think I am in my last days but it doesn’t really matter because I have had such a beautiful life. LA Times film critic Betsy Sharkey said the film “swept her away”. “Her story began in Prague in 1903 where she was the child of privilege, her memory sharp in remembering Franz Kafka and composer Gustav Mahler’s visits to her house,” wrote Sharkey. “Then World War II, and Hitler’s death camps, dismantled that life; her skill at the keyboard saved her. Around 140,000 Jews were sent to the Terezin camp, of whom 33,430 died. Email “The oldest-known Holocaust survivor has died aged 110”. Feedback on “The oldest-known Holocaust survivor has died aged 110”.